Awakening, Ascension and Twin Flame Union – What Energy Support And Guidance Is Trying To Reach You From The Natural Kingdom? Today I was guided to provide a resource on a subject we’ve not touched on yet for the Twin Flame journey. Spirit animals and symbolic messages from the natural kingdom. This is something I’m often asked about, and since my own journey began it’s often felt like there are symbols and messages wherever I turn – especially in the form of repeating, symbolic animals. Whether they arrive in the form of logos on shop signs, photos on the internet or in person… animals carry strong symbolic messages of wisdom that are trying to get through to you. What Wisdom Is Trying To Reach You? 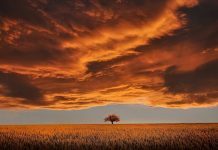 And you will notice throughout your path there will be periodic themes to your experiences – and in these periods, certain spirit animals are likely to show up with “messages” and support. How this happens is, your attention is repeatedly drawn to these symbolic animals and the wisdom and energetic support they represent. You do not have to interact with an actual animal, but the energy that a certain animal species represents is somehow helpful to you right now – and you are being alerted to it. Often, it’s enough to look up online what an animal stands for, what wisdom they embody and what about them can assist you both practically and spiritually right now. I would always recommend clearing and uplifting your energy so you get a “clear channel” both for your benefit with Twin Flame Reunion and so you can “tune in” to what your animal messengers are trying to communicate. Did you know Twin Flame Union can only happen up in the registers of Unconditional Love? Take the channeled Quiz here to discover whether you’re really open to the Love and Reunion you desire. In the Vibrational Alignment Program for Twin Flames we go through opening up your spiritual channels of communication to open up your Twin Flame telepathy, and I show you how to safely receive guidance – avoiding ego and negative influence. Discover more about this here. At this point in my journey, I have developed a “secret language” with my guidance team like this. Often these messages show up in my mind’s eye. If I’m being shown hummingbirds I know it means – focus on happiness, be light on your foot, try to not worry. If I see Swans, my Twin soul is communicating – I love you eternally. If I see a lion, I know it’s a message to be brave and proud, to center into my power and forge on. If I see a raven or an owl, I know there is something I need to ‘see beyond the human illusion’ with – that this world and the next are not as separate as we may believe. Being familiar with animal archetypes this way can be incredibly helpful on the spiritual path, where we are always moving into uncharted territory, faced with ever new challenges and opportunities for growth. Spirit suggests you use the Free Guided Meditation in the Twin Flame Help Kit and intend that when you get to the garden you will be meeting your totem animal. This is the archetypal animal energy you are the most closely connected with in this life. Your totem animal is your guiding star, so to speak. This can be an incredible and humbling experience, which I would highly recommend trying. Much like so-called “angel numbers”, repeating sequences like 11:11, 333, 777 and 222 (have a look at these here) – spirit animals and animal symbols can be a powerful help on your journey. 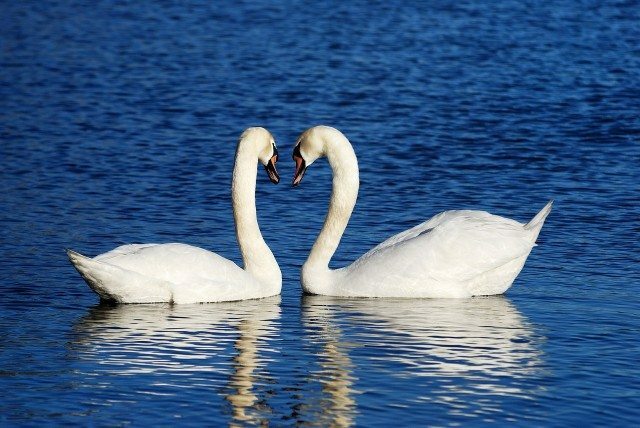 For example, swans are one of nature’s monogamous species – they mate for life and are a common symbol of Twin Flame Union. So, what animal archetype or number or sign do you keep seeing? I’d love to hear about it – please leave a message in the comments below. Most Twins have individual animal guides, energetic support for guidance and evolution of the soul. But we also have Totem Animals for the Twin Flame Journey, and these can change depending on what stage you are at of your Union unfolding. What is this trying to tell me? What do these animals represent? How do they live? How has human culture represented them symbolically? What can I learn from them, what message might they be trying to convey? This article is focused on Twin Flame specific spirit animals – monogamous species. But you might be seeing other “messengers” on your path. Are there other animal spirits you keep seeing on your journey? If so, leave your comment below with the name of the animal you want to know about, and I’ll create a future article with even more insights into spirit animals! I left out Unicorns as this is a symbolic mythological animal, but this is often a symbol that shows up during the Twin Flame union process or to remind us of the underlying eternal unity of the Twin Flame pair. Swans mate for life – they represent the energy of Unconditional Love and Twin Flame Union. The eternal love of oneness between two beings. Swan energy is gentle, elegant, wise. They glide with ease through the water but are very protective of their mate. When swan appears on your path, you are reminded of the eternal love between you and your Twin Flame as souls. That you “belong” together. To learn more about the Twin Flame Mission of unconditional love, have a look here. Like their cousins, the pet dog, Wolves are fiercely loyal to their pack. Above all their mate. 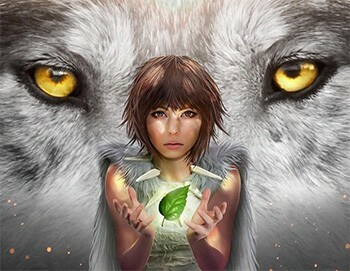 Wolves mate for life and represent moon energies, lunar energies. Intuition, pack wisdom and the soul’s deeper knowing. 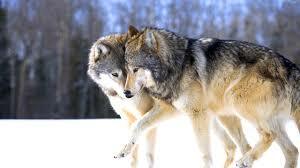 Wolves live in packs and are intelligent hunters who collaborate to get the most of their labour. When wolf appears on your path, you are reminded that your mate’s soul is willing to fight for you and that they are eternally loyal to you. You are being shown that they will do what it takes for you to be together, and to listen to your feelings instead of your mind. Your heart is where you will feel the strength and the truth of your connection. You are never alone – there is spiritual support all around you. Many Twin Flames get overwhelmed by the purge of negative emotions that happens in the Twin Flame Ascension process. Learn more here about how to use your feelings and your heart to your advantage, to reach a state of harmony and Reunion with your Twin. 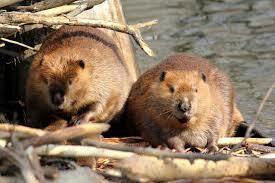 Beavers are another mammal who mate for life. These are very hardworking animals who know the wisdom of manifestation. Step by step, if you take the right actions you will get to your goals. Beavers build structures most humans would struggle with, and that even big machinery would take much time and energy to complete. Beaver’s wisdom is in taking things step by step – holding the bigger vision all the while. Knowing what it is you are desiring to build, and taking step by step action to get there. If you do not have a vision, you cannot build something big. Beaver’s energy carries the wisdom of rolling your sleeves up and getting started. Unless you take action, things won’t change. When beaver crosses your path, you are being reminded that the Twin Flame journey is a path of co-creation. To hold your vision of love in your heart and your mind – progressing day by day and not letting fear sway you. Even if your Twin is unawakened, their soul is working with you all the way in this collaboration of love. Beaver’s message is, if you keep progressing toward your goal you will eventually get there. Let the vision of love pull you forward. 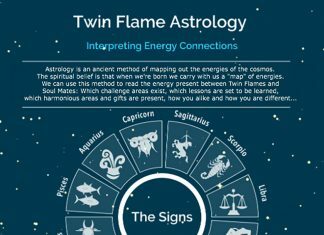 I was guided to create a special resource with actionable, step by step advice on how to reach Twin Flame Reunion here. Have a look. Penguins mate for life and are incredibly loyal animals who undertake hard journeys together without letting go of each other. Penguin energy is very gentle and emotional. These animals are strongly bonded to each other and carry out tireless journeys through harsh environments to get back to each other – all the while collaborating on their family and taking care of their offspring. Even though they spend months apart traversing the icy cold, they are bonded by love. Penguins are elegant swimmers and powerful hunters in the water, although they might seem clumsy on land. This is a message of effortless navigation of the emotions. 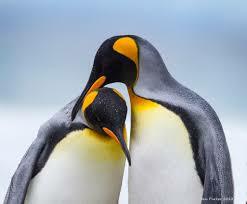 When penguin crosses your path it is a message that you and your love are always bonded by the heart. No matter how long you are apart from each other, in your heart and emotions you are always together. Penguin teaches that physical separation is no barrier to love. Go here to get a free guided alpha level meditation to connect with your Twin Flame on the soul planes right now – no matter how far apart you are physically. 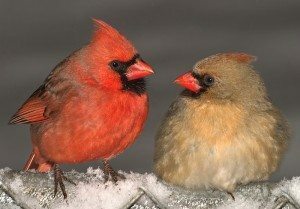 Most songbirds mate for life, and are another symbolic animal guide for the Twin Flame journey and in love. These messengers are carriers of the wisdom of the throat chakra. What are you “speaking into” your love connection? What stories are you telling about your connection and about your mate? Speaking, singing and writing are all creation, manifestation. Songbirds remind us of the power of positive speaking, positive communication. They are often feisty animals who are unafraid of getting “loud” to protect and charm their mate. Songbirds are always vocal, and carry the message of celebration and pride. Depending on the colour of the songbird, they carry different messages. Blue represents spirituality, communication and the throat chakra. Yellow symbolizes vitality, happiness and the solar plexus. Red symbolizes pride, passion and the root chakra. Green symbolizes healing, love and the heart chakra. However, always tune into the “messenger” yourself and allow their specific meaning and message for you to come forth. To learn more about the chakra system, manifestation and how it impacts the Twin Flame connection, have a look here. 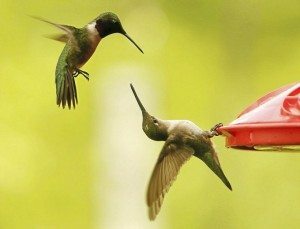 Hummingbirds are powerful messengers of the higher dimensions and the lightness of being. Tiny birds who have the power to move their wings thousands of times per second, they are incredibly agile and light on their wings. Hummingbirds symbolize the wisdom of happiness and effervescent joy. When we are happy for “no reason”, happy in the now moment, we are standing in our power as souls of light – attracting more ease, more progress. If we are always out “chasing”, the energy creates an ongoing cycle of always chasing. We don’t allow things to “catch up” with us. When hummingbird crosses your path, you are being reminded to enjoy the now moment. To allow yourself to be happy “no matter what”, to relax into the little joys of life and to allow your high state of being to effortlessly attract that which you desire. Hummingbird reminds you that you don’t have to try so hard. That being light about things is a form of “magic” that attracts joy and love to you. Elevating your energy vibration is the number one way to step out of challenges and into a smoother way of life where you attract harmony and love in your relationships. Learn more here. White doves are one of the most powerful symbols of spirituality we know in the human world. For millennia, the white dove has been a symbol of peace, heaven and the purity of the divine. Their energy is mild and feminine. 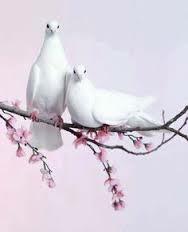 Another bird that mates for life, white doves carry the message that love is where we come from. Love is who we are. For Twin Flames, a message to center into who we are as souls, because we are already one. They remind us to look in our hearts and have forgiveness (also for ourselves) because as souls we are immaculately pure. White dove is a powerful messenger of high vibrational energies of peace. To lift our perspective up past the human world of judgment and blame, and to see the unity and eternal harmony beneath surface differences. When white dove crosses your path, it can also be a message from your Twin Flame’s soul that they love you unconditionally – no matter what you do or have done, no matter how “flawed” you might see yourself as. White doves are closely connected with the spiritual realm and we are reminded of white feathers left as messages from the other side that you are loved, that you are always supported, and that you are always safe. Your support team and your Twin Flame’s soul are always eager to communicate with you. Discover in this article how to invite your Twin Flame’s eternal self to step forth into your life, to support you along your journey and show you the love they feel. Want more? Download the Free Twin Flame Help Kit to get info on the awakening code 11:11 and the Ascension process going on across the planet right now, plus a deep Alpha Level meditation to connect with your Twin Flame on the soul planes right now! Or, for my step-by-step “roadmap” to Twin Flame Union, created after my Twin and I reached – have a look at the Vibrational Alignment Program for Twin Flames. And you can read here about other Twins’ experiences with the program! Sign up here to get the Full Yearly Twin Flame Energy Forecast for Free!